Hurray! It’s that time of the year, when Santa proves himself worthy, by ensuring lots of wishes come true, for people all around the world. For the ardent shopper, Christmas shopping is a fun exercise filled with exciting challenges but for the reluctant shopper; Christmas shopping is a minefield of wrong purchases and choice dilemma. This year, in the spirit of the season, the fashion fairy has made the “gift-buying” minefield safer by dropping her Christmas wish-list on my desk, as an early Christmas present. For the late shopper, who is still torn on deciding, what to purchase, as a Christmas present, for the fashionista friend, lover, mother, sibling, relation or colleague, here is your absolute guide to fun shopping and gift-exchange experience. 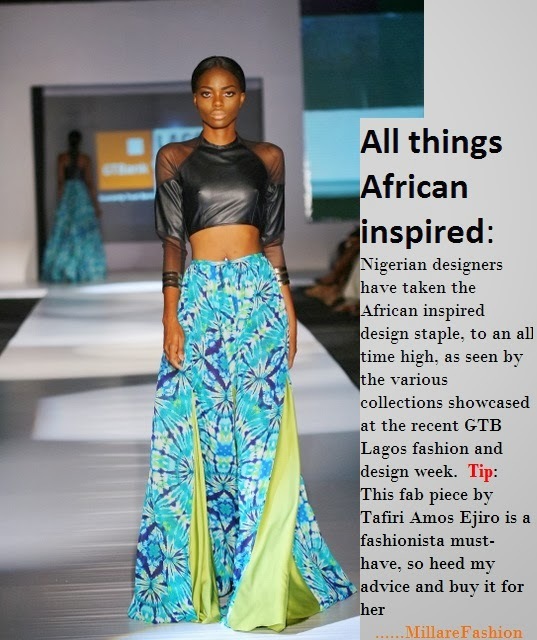 Style lovers worldwide are in a lifelong affair with fashion, obsessing about trends and lusting after coveted fashion staples. 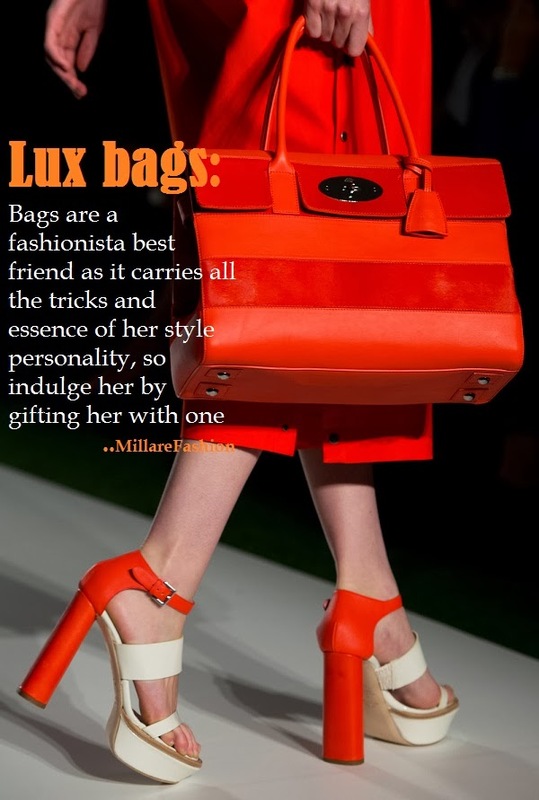 Buying a fashionista a coveted item or trending staple is sure to make her scream with delight but as you know, the female heart is mysterious. So be sure to add a personal touch by accompanying the present, with little gift items. For instance a spa coupon, jewelry, roundtrip ticket to an exotic location or resort, signed blank cheque (for the very brave of hearts), car keys, house keys, et al. 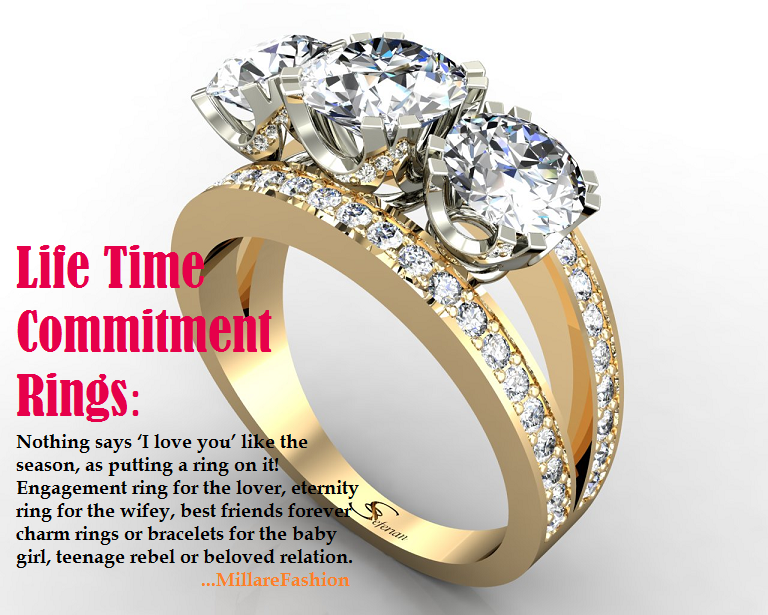 Life Time Commitment Rings: Nothing says ‘I love you’ like the season, as putting a ring on it! Engagement ring for the lover, eternity ring for the wifey, best friends forever charm rings or bracelets for the baby girl, teenage rebel or beloved relation. 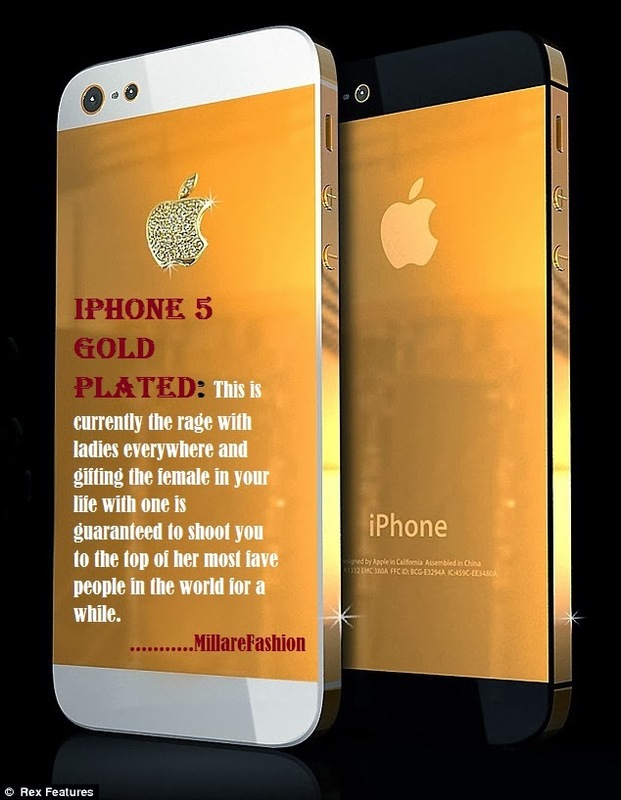 iphone 5 gold plated: This is currently the rage with ladies everywhere and gifting the female in your life with one is guaranteed to shoot you to the top of her most fave people in the world for a while. Shoes! Shoes! Shoes! Every fashionista worth her weight in style never gets tired of shoes especially if it’s a high end designer shoe, on the must-have lust list of style lovers globally. 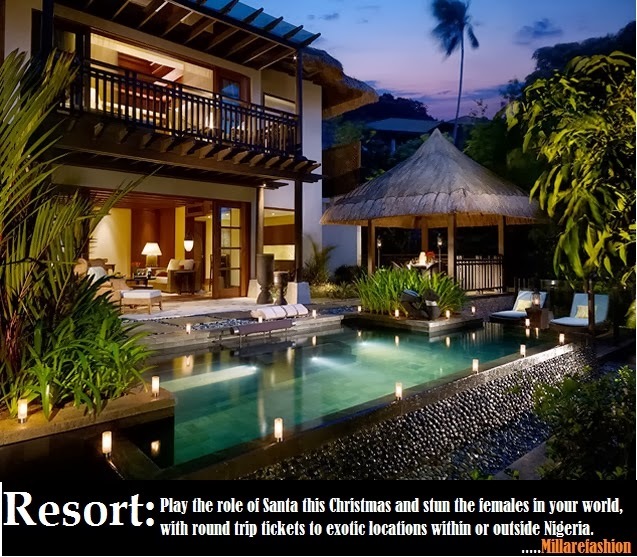 Resort: play the role of Santa this Christmas and stun the females in your world with a round trip ticket to an exotic location within or outside Nigeria. 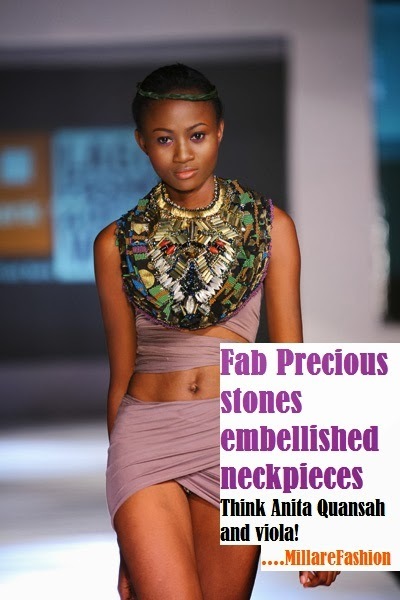 Fab Precious stones embellished neckpieces. Think Anita Quansah and viola! A car! No fashionista relish the idea of walking to the bus stop on uneven road, to take a cab to an event, office, church, mall, or visit friends. 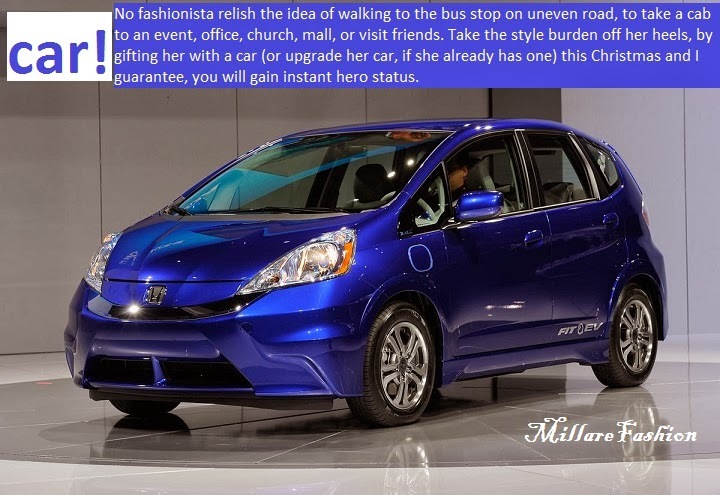 Take the style burden off her heels, by gifting her with a car (or upgrade her car, if she already has one) this Christmas and I guarantee, you will instantly gain hero status.